top. It was here, just yards away from this cave, that we found the huge bear prints, covering our tracks from the night before ! They were about 10 inches long - almost certainly a brown bear - if so, even for 25 years ago, this had to be rare. So if anyone says there are no brown bears left in Iran - there was one in 1977 ! I took this shot myself, on the self timer ( and rugged Zenit 3m ) when I returned alone to pick up some gear - I stayed here the night alone and remember the deathly silence - which was constant. 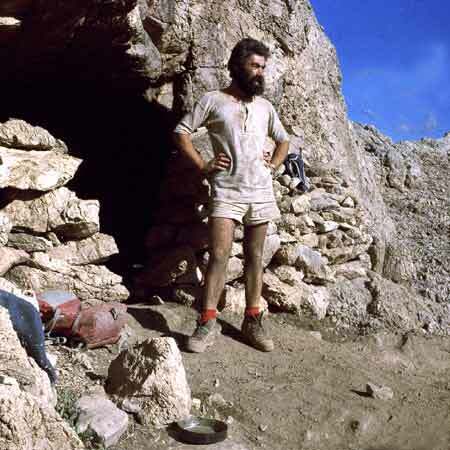 All the Kurds had moved back down the mountain by now - they kindly left the cave infested with fleas. It was this cave that we had woken in the night to a strange 'tip, tip, tippy' sort of noise - we found it was a thousand fleas jumping up on the polythene and landing again. Although dusty, sleeping conditions were good - no wind, no dew - but bitter cold as soon as the sun went. We had good bags - this probably why the Kurds moved back down the mountain before the end of the Summer.